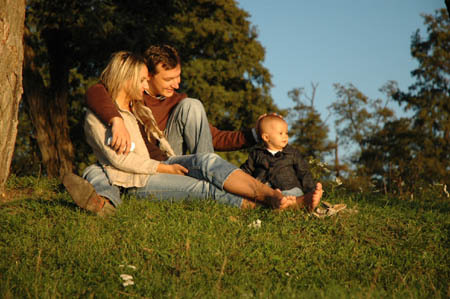 Creating perfect family portrait poses can be tricky if you are not well organised and have a good plan in place. Times have changed since the day when a photographer would stand behind a massive piece of photography equipment and say ‘cheese', catching whatever still life pose that happened to be presented. Mobility is key for the photographer with lightweight cameras that allow them to find different angles and unexpected expressions from family members at just the right time. Being able to create a relaxed scenario while not losing control of the proportionate stance of the family group is sometimes difficult but possible with a skilled photographer. 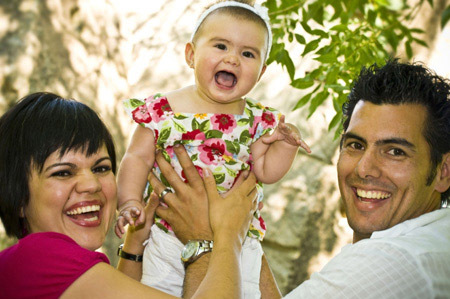 Try these easy family portrait poses to get you started. Place the family in a pyramid or triangular pose so that there is a symmetrical look. You do not want all tall members on the right side and all shorter individuals on the left. If you have trouble with structuring the body sizes, use props. A stool with a tall member leaning in with one foot atop the stool can present a casual look while redefining the height. 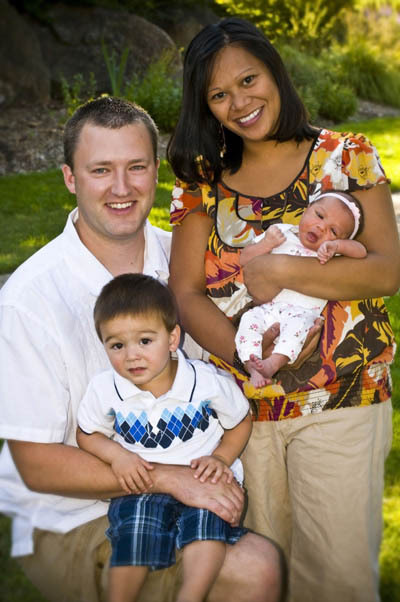 Proper planning on what type of portrait would fit your family pose is more important than the actual photograph. Gather information concerning the family and use it to bring about certain expressions from the group. Never give commands that will give you a stiff and somber image of your subjects staring straight at the camera. Instead, search for that unexpected question that puts a twinkle in every subject's eye. For example, a picnic that ended in disaster when all four family members rose from one side of a picnic table and the table suddenly tipped and dumped relatives on the other side backwards, food halfway to their mouths. Get past the horror and turn it into a comedy to generate laughter that won't stop. The point being is to put your subjects as ease so they entirely forget about the camera and are involved as a group in a special memory. Family portrait poses of profiles can bring out a best side of family members. Learn to look for your subject's great physical qualities and place them in a position to where this is enhanced. Remember that the group needs to appear as one but to also shine individually. The backdrop is secondary and should be toned down in respect to the family members. You don't want the group to blend into the scene but to stand out and take the spotlight. Play with your camera to get just the desired focus and light that will fall on your subjects while letting the background flow indirectly and naturally. Most importantly, sit down with your family members and get to know them. Anyone can stand a group together and tell them to smile and this is exactly what the portrait will look like. A great photographer will focus on bringing out the artistic nature of their subjects by focusing on physical characteristics, interaction with other family members and using the right language to bring on a host of emotions. Listen to stories and watch the gestures of each member to get the right feel for capturing unforgettable family portrait poses. Secretly, this is what everyone hopes to receive from a family portrait. 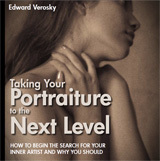 If you want to get more from your portrait photography, I can recommend an eBook from Edward Verosky called "Taking Your Portraiture to the Next Level". Ed doesn't go into family portrait photography at all in this eBook. Instead he focuses on the basics of portrait photography and making best use of available lighting. There is a alot of example photos in the eBook and he talks you through each shot explaining the technique required to achieve it yourself and how to use reflectors, natural light and studio lighting. One you have mastered the basics of portrait composition and lighting, it will be easy to create your own family portrait photographs using the skills you have learned.